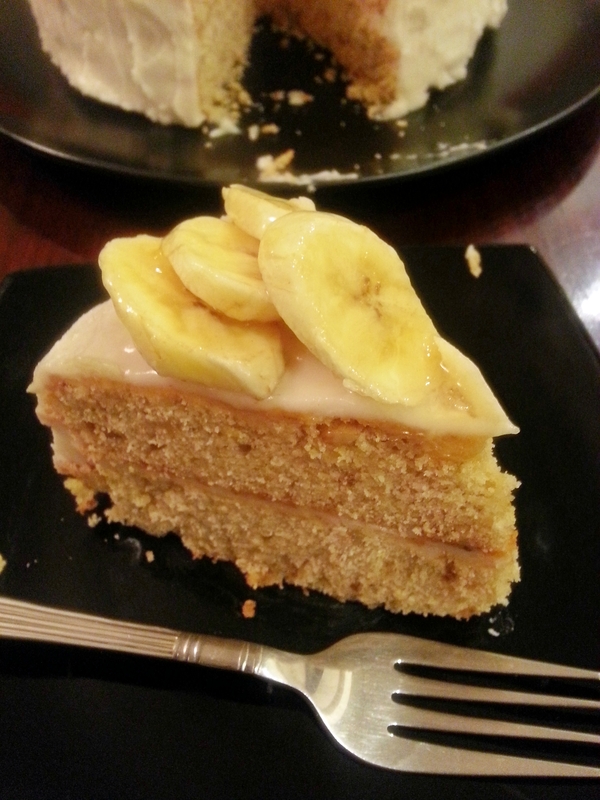 I am so hooked on to banana recipes desserts/breakfast/snacks any form I just love eating it. 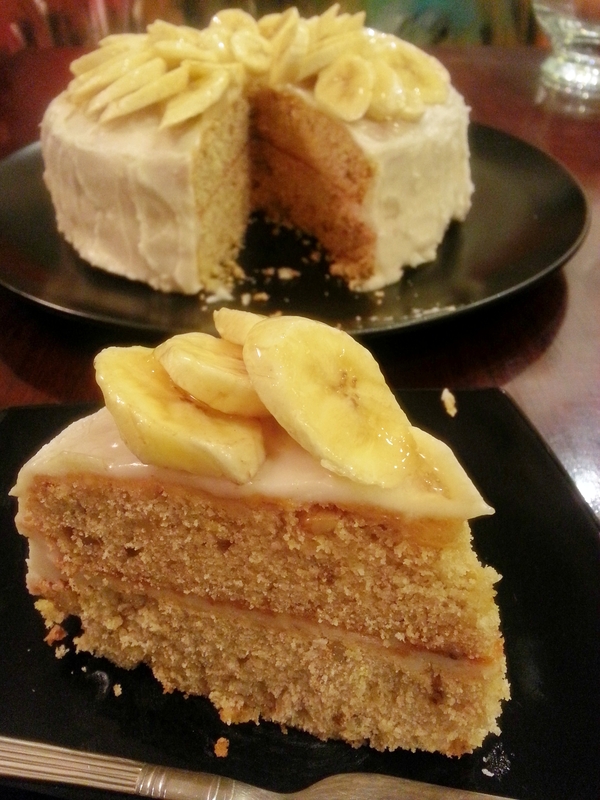 This cake is like a banana bread in a fluffier form with lemon and walnuts yum-o! I always buy more bananas as I love to bake with them and add them to smoothies or just grill them and have them with vanilla ice-cream and whipped cream( i must put that recipe here too). The real hard part is to buy all those bananas and then wait for them to ripen its very very seldom that I get overripe bananas in a grocery store. 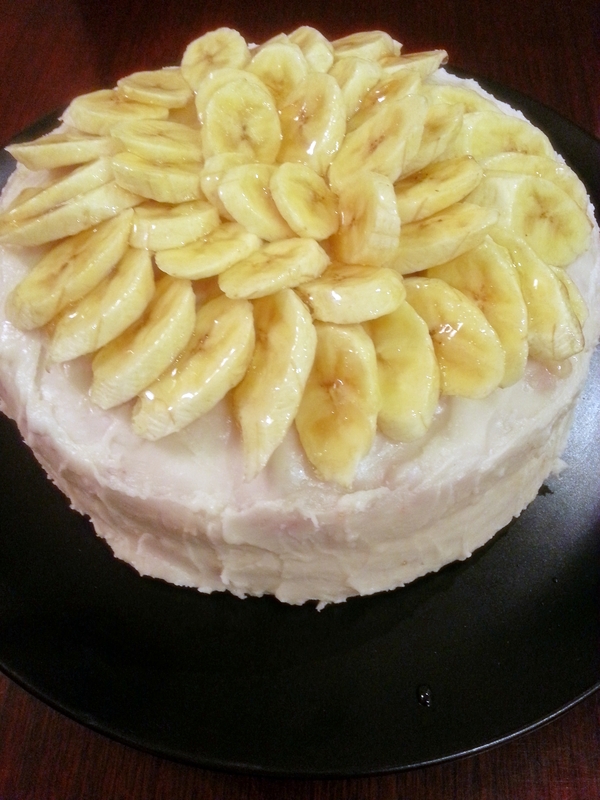 I love eating this cake for my breakfast its so delicious, moist and dense the lemons add so much more flavour to it and I have glazed the bananas with more lemon marmalade all in all a fantastic treat to start your day. Preheat the oven to a 180 degree centigrade. Line 2-9 inch round cake pans with aluminium foil, leaving a slight overhang of foil on two sides. Spray foil with cooking spray, then dust evenly with flour and shake off any excess. In a mixing bowl sift the flour with the baking powder and salt. Set aside. In another large mixing bowl, cream the butter with the sugars and 2 tbsp vegetable oil until light and fluffy, occasionally scraping down the sides and bottom of the bowl, about 3 minutes. Stir in the remaining vegetable oil beat in the eggs, one at a time mixing until combined after each addition and stir in the lemon rind. In a small bowl mix the mashed bananas with the vanilla and milk. Add the banana mixture and the flour mixture to the butter mixture in 3 batches, beginning and ending with flour mixture and mixing just until combined after each addition. Fold in the nuts. Divide the batter between the cake pans and spread it out evenly. Bake until a cake tester inserted in the centre comes out clean around 30-35 minutes. Allow to cool completely on a wire rack before frosting. For the frosting, in a bowl cream the butter until smooth, then gradually beat in the sugar and stir in the lemon rind and enough juice to make a spreadable consistency. Set one of the cake layers on a serving plate cover with about one-third of the frosting top with the second cake layer spread the remaining frosting evenly over the top and sides of the cake. To make the topping bring the lemon marmalade to a slight boil in a small bowl in the microwave oven or in a small saucepan. Peel the bananas and cut them on the bias into slices that are a scant 1/4 inch thick. Toss them lightly with just the slightest bit of lemon juice- the juice will keep them from blackening. Arrange the banana slices in concentric circles over the top of the cake, start at the outer edge and slightly overlap the slices in a circle having each circle slightly overlap its neighbour. Brush the bananas with a thin coating of the hot marmalade, glazing them evenly. Allow the glaze to cool a bit before you slice in. Thank you so much for liking the post, you yourself are so amazingly talented and if you approve of something it means a lot. Love mauli.